Children and adults are fascinated by space and at some point most of us fantasize about being astronauts Today the activities are going to focus on introducing The Eight Planets, the children will hear some brief facts for each planet, then they will identify that the planets are shaped like a circle and they will practice numbers 1 thru 8 by doing a simple activity in which they will see how each planet is positioned away from the sun. There are eight planets and three dwarf planets in the solar system. 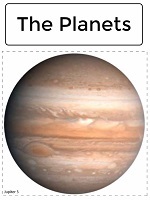 At Kidzone's Planet Facts young children will get to see neat pictures of the planets and you can share (adapt to the children's age) some basic facts about planets. Share with children that this report about the planets was prepared by Tasha age 7! Great job! Ask what shape are the planets. Have the children try to identify colors in each planet. Ask children to point to the planet that has rings around it. Count the planets from 1 to 8. View this image of the eight planets, and the dwarf planets: Ceres, Pluto and Eris to support the activities below. Optional: star stickers or glitter glue. 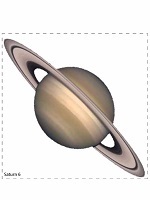 Print the planets image cards. The Jupiter image, also has a banner title. 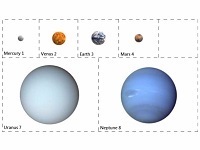 The planets are numbered from the one closest to farthest from the sun. Mercury #1, #2 Venus, #3 Earth, #4 Mars, #5 Jupiter, #6 Saturn, #7 Uranus, #8 Neptune. Cut out the cards, or have the children practice scissors skills. Place the planets in numerical order. Point to the numbers on each planet card. Proceed to make a vertical o horizontal banner or a mobile placing the banner title at the top. Use dark blue or black construction paper for banner to represent the night sky. Glue the images in numerical order under the banner title leaving a gab between them. Optional: to add nterest to the banner, "sprinkle" some star stickers or glitter glue around the planets on the banner. Hang the banner and pracice counting and naming the planets. For mobile, add the sun using a paper plate painted yellow or cut a sun using construction paper. Use string or ribbon to hang the images using shorter lengths of string for the planets closes to the sun and longer string for the planets farthest to the sun.